Floods are not uncommon in Mozambique. But linked with cliamte change the floods are now more common then ever. In the past the rivers of Zambezi, Púngui and Búzi flooded every 10 year, then the people living on the banks of the rivers had to evacuate. Often to be on the mercy of international aid organisations like the Red Cross. After the floods they would then return to their land near the rivers. ..Now people are evacuating their lands for a less fertile land far from the rivers. They do so with the help of international aid organizations mostly manned by local people. 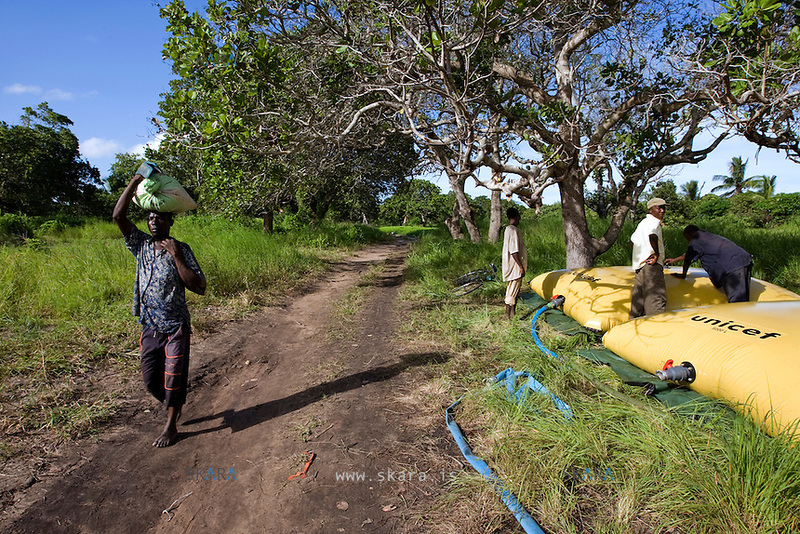 ..20.000 litres of chlorine-filtered water awaits distribution to the flood victims in Mozambique last February (2008). Instead of a team of international aid workers, local people are stepping up to take on that role..